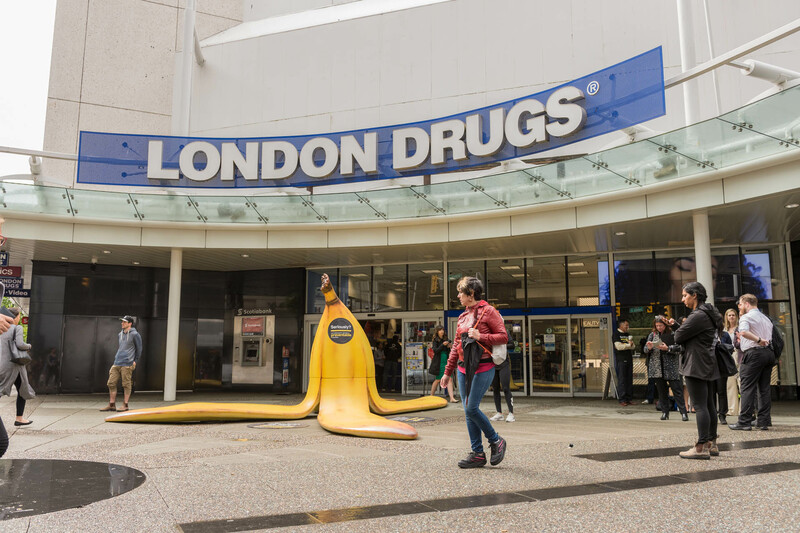 The Community Against Preventable Injuries (Preventable) is kicking off its 9th year with an 8-foot banana peel in downtown Vancouver. Located just outside the downtown London Drugs at the corner of Granville and Georgia Streets, our silly sculpture has a very serious point: most “accidents” aren’t really accidents at all. Most of the time, you can see them coming—just like a humungous banana peel. And that makes them 100% preventable. The larger-than-life banana peel is a cross-cultural, language-independent, universal symbol of the accident that’s waiting to happen. We thought it was the perfect reminder that actually, serious injuries don’t just “happen.” They happen because we willingly close our eyes to the risks that are right there in front of us. Throughout Preventable’s history, we’ve worked hard to combat the all-too-common belief that serious injuries are “inevitable.” And we’ve consistently challenged the idea that serious injuries only happen to “other people.” Because we know these attitudes are the common thread that underlies all serious injuries, whether they’re caused by motor vehicle crashes, falls from ladders, drowning, mixing medications, or anything else. Let’s not kid ourselves: every day, we take risks we know could lead to injury—we speed on our way to work, we text while crossing the street, we stand on the top rung of the ladder. It’s not like we don’t understand what could happen. We just choose to ignore it. The banana is an exaggeration of the risk that is right in front of us. You can’t ignore it—you literally have to see it coming. Because we can see it coming, we can prevent ourselves from tripping on it. Wouldn’t it be great if we thought the same way about all risks?